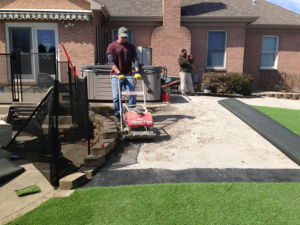 Motz Turf Farms is the only sod farm in the Cincinnati area that provides and installs synthetic turf for residential and small commercial areas. 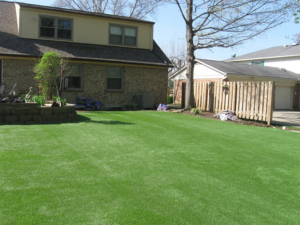 Synthetic turf is the perfect solution for yards where grass just won’t grow. This could be the result of large trees blocking the sun and soaking up moisture, pets, kids, or even that picture, perfect picket fence. 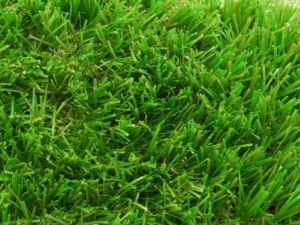 Call Motz today to discuss your synthetic turf options. WHY CHOOSE SYNTHETIC OVER NATURAL TURF? 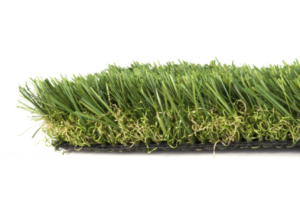 • Great for difficult natural turf growing areas – shade, drainage, play, high traffic. 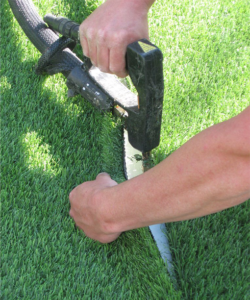 If you wish, our professional staff will prepare your site for synthetic turf and handle all aspects its installation. Motz Turf Farms can deliver what is needed to complete your project. Our fleet of trucks provides free forklift service, placing your new turf in locations convenient for you. • Pick up the poop – remove all organic debris to inhibit odors and help prevent weed growth. 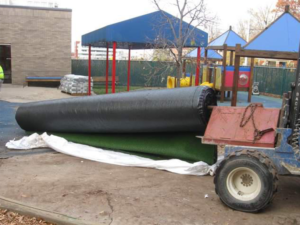 What maintenance is involved with synthetic turf? Your synthetic turf should be rinsed and cleaned, as needed based on traffic and use. Will water drain from synthetic turf? Will synthetic turf harm my pets? Synthetic turf is great for pets, allowing them to exercise outdoors in all weather conditions. (No muddy paws!) Urine will not damage or stain synthetic turf, and its durable construction prevents digging. Should I have infill in my synthetic turf? Infill is the foundation for your synthetic turf fibers, helping to prevent crushing and compression remove and compression of turf blades. It also acts as ballast, giving weight and stability to your lawn. Where do I find synthetic turf? Motz Turf Farms, LTD. has recently become an authorized distributor of residential and commercial synthetic turf for The Motz Group, Inc., the region’s leading installer of sports and recreation fields. 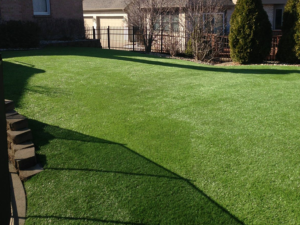 Their technical support is combined with our leading experience and reputation to deliver top quality synthetic turf to residential and commercial customers throughout the Tri-state. • Great for areas where natural turf is difficult to grow – shade, drainage, play, high traffic.